A surprising twist in “The Abominable Bride,” the most recent episode of Sherlock (BBC), Steven Moffat’s contemporary re-working of Arthur Conan Doyle’s detective stories, is that the conspiracy uncovered by the work of Sherlock Holmes is the work of suffragettes. I found this curious given the fall release of Sarah Gavron’s Suffragette, a British drama set in 1912. In each of these very different films, conspiracy swirls around the suffragette cause, clouding the systemic and institutional factors that kept women out of the center of political life in the Western world until a quarter of the twentieth century had already passed. The suffragette conspiracy in 1895 turns out to be entirely within Sherlock’s “mind palace,” a plot contrivance that posits Holmes’ genius. 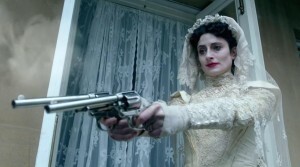 The gimmick of “The Abominable Bride” is to give fans a New Year’s Day present in setting the contemporary series in Doyle’s Victorian England. Unfortunately, this is also its most troubling maneuver. Rather than seeing the struggle as a brutal war against patriarchal power, “The Abominable Bride” depicts its outcome as a foregone conclusion. The humor of the episode, that Watson and Holmes treat shabbily all of the women who surround them, to the point of invisibility, is only funny from the present. At the time, such ill treatment was the social motor of the liberation movement. The film, Suffragette resolves some, but not all, of these problems. The film focuses on Maud Watts (Carey Mulligan), a laundress who as a child was sexually abused by her boss. When a new generation suffers under the boss’s lechery, Maud begins attending suffragette meetings. By the end of the film, Maud’s husband casts her out for her political activities, denying her the ability to see her beloved son. Arrested repeatedly, Maud is force fed milk by the jailors in the film’s most intense scene. Inspector Steed (Brendan Gleeson) echoes the role of Mycroft. He uses the power of the police force to run surveillance on the leading suffragettes. Initially, rather than seeing women’s liberation as a foregone conclusion, he works aggressively against the women. However, by the time the government is brutally force-feeding the hunger strikers, he expresses grave doubts about their actions. Even more incongruously than Sherlock, the male antagonist begins to question his own villainy. More curious is the appearance of Meryl Streep, who plays a shadowy suffragette leader, Emmeline Parkhurst. She is in only one scene, where she emerges out of hiding, veiled, to deliver an inspirational speech. Inspector Steed rushes to apprehend her. However, the women have anticipated his actions, and substitute a different veiled woman, allowing Parkhurst to escape. This oddly replicates the plot of “The Abominable Bride,” in which a veiled murderous woman is replaced by a corpse to terrorize the population of London. In Suffragette, present-day women’s rights advocate Meryl Streep, the most honored actress on the planet, appears in a cameo bringing the voice of the future back to redeem the past. 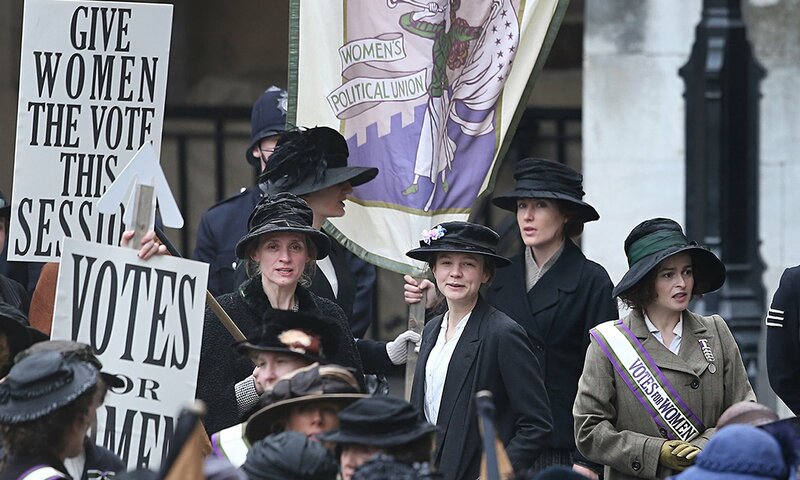 Suffragette ends with written text that is far more interesting than the film that comes before it. We are didactically informed the dates when women earned the right to vote in various nations: Britain in 1928, the United States in 1920, and the oddest, Switzerland, 1971! This would make for a far more interesting film: how could men in an advanced democracy in the heart of Europe vote in 1959 in a 2 to 1 majority, against universal suffrage? The text ends with 2015, when the United States’ ally, Saudi Arabia promised women the vote. Indeed, two months ago, in December 2015, 130,000 women registered to vote in Saudi Arabia. As two very different angry white men—Donald Trump and Bernie Sanders—position themselves to derail the best chance I expect to see in my lifetime for the election of a female president of the United States, we might do well to ponder how we represent the suffragette movement, a crucial moment in civilization’s ever stilted path toward unleashing our full humanity.